Michael Moore created a documentary called Bowling For Columbine . In it he explored the question, why does America have so much gun violence? He investigated various possibilities and discarded them. He did not come to a clear conclusion. He did not make any specific recommendations. Moore is an NRA (National Rifle Association) member and won a NRA marksman medal as a teen. The movie is not quite the ultra left liberal movie you might expect. He allows people of all parts of the political spectrum, including the lunatic right to make their points. In the final scene, Charlton Heston (NRA spokesman) makes a dramatic point by slowly and silently walking out of the interview — the NRA refuses to take responsibility for the negative side of high gun use, only the positive side. But it is Heston himself who makes this point so eloquently, not Moore. Moore just records it. However, Moore wordlessly lets you know where he stands by leaving a photo of six year old girl shot by a six year old boy in Detroit, propped against a pillar in Heston’s house. For some reason, in the USA, a large number of people are killed each year by gun violence. Other countries don’t have this problem. The movie provides the following statistics. American gun ownership is exceptionally high. Perhaps that is the problem. Yet Canada has equally high ownership and they have much less problem. Americans are exposed to ultra-violent video games. Perhaps that is the problem. Yet so are the Japanese and they have an extremely low rate. Americans have a multiracial society. Perhaps that is the problem. Yet so do the British and they have low rates. America was involved in a divisive civil war. Perhaps that is the problem. Yet other countries had them too. American watch ultra-violent movies. Perhaps that is the problem. Yet other countries do to, watching the very same movies. What is unique about America? What could possibly be a cause? I came up with this list. Moore hints at some of these in his movie. This is primarily a list of what is unique about America and only secondarily about what are plausible causes. The USA was the only western country to historically make extensive use of slaves. Descendants of slave owners inherit the family attitude of fear of blacks. The USA was the only western country that historically recently killed large numbers of indigenous people. Descendants of pioneers inherit the paranoia of those involved in the massacres. The USA’s TV news and reality TV is the most violent of any country. Adrenalin keeps the ratings up. People come to believe they live in a world far more dangerous than it actually is. The USA is the dominant economic and military power on the planet. Americans have the normal paranoia of the wealthy that others are just itching to take it all away. The USA had a period of prohibition which lead to the rise of the Mafia and a glorification of the mob in pop culture. Mob morality leaked into everyday life. Prohibition provided high profits to the rum runners. A shot could go for $3 where prior to prohibition it was only a few cents. The need for transporting and warehousing large amounts of liquor forced criminals to co-operate. They had coordinate the bribing of thousands of officials. Criminals had to get organised. The USA has a much stricter prohibition on drugs than other countries do. Other countries focus more on harm reduction, treatment and education. The resulting high profits stimulate violent turf wars between drug dealers. America is the most Christian western nation. It tends to favour fundamentalist denominations that teach God is cruel, vengeful and violent. Right wingers generally are doing most of the shooting. They learn the notion of violent retribution from the pulpit. Americans have a love affair with the automobile. Most of the rest of the world don’t use automobiles to anywhere near the same extent, even when they own them. Americans isolated in their cars don’t rub shoulders with the same people day after day the way people in other cultures do. The car lets an American range over a huge territory each day. The automobile means Americans tend to live in a world mainly populated by total strangers. There is a natural primate distrust of strangers. The USA has the 2nd Amendment which gives a constitutional right to bear arms. Americans tie gun ownership to virtue and patriotism more than anyone else. They are much more emotional about guns. Protection of property is extremely important to Americans. It morally, if not legally, justifies killing a suspected thief. People in other countries tend to value life above property even the life of a burglar. People often kill family members mistaking them for burglars. The USA is the most laissez faire capitalist of the western democracies. I develop this idea later. Young Americans often enlist or are drafted into military service. Part of the training for this is boot camp, a type of brainwashing where recruits are taught unquestioning obedience to authority. They are also taught to kill perfect strangers on command. There need be no reason at all for the murder. Something I notice in the USA is that people are terrified of strangers and criminals. I once spent a snowy, bitterly cold, night freezing outside in Portland because no hotel would let me in without my passport which was locked in a train station locker. I had plenty of cash, a debit card and credit cards. One hotelier explained the law was somehow to prevent me from using drugs once I rented the room. I still fail to see the logic, but then the paranoid are not big on logic. You don’t see this fear of strangers in Canada or Europe. People in Europe’s public squares talk to each other — to perfect strangers. Little children rush about all over talking to everyone. Everyone is relaxed. This fear explains why people buy guns, but it does not explain why they use them in anger so frequently against family members. It also does not explain why the extreme fear exists, in the first place. When Oprah had Michael Moore on her show, she also invited Barry Glassner. 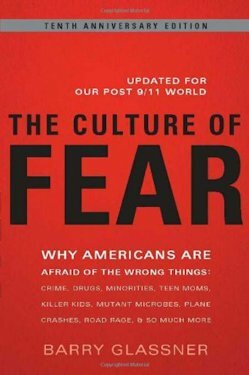 He is the author of Culture of Fear: Why Americans Are Afraid of the Wrong Things . He talked about how the media like to frighten the people because it increases ratings. TV news make Americans fear things that statistically are not likely to harm them such as sharks and killer bees and razor blades in apples and yet fail to worry about pensions being insufficient to live on. The media trick Americans into being unduly afraid of black people, especially black adolescents. They hide the fact that black males are or more often victims than criminals. This has relevance to terrorism. SUVs kill more people that terrorists, but the USA is planning on spending trillions to protect itself. Moore also talked about the same false fear phenomenon as Glassner. When murders went down 20%, media coverage of them went up 600%. The public got the illusion crime was spiraling out of control. The razor blade in the apple story was an urban myth and yet now American children no longer get to enjoy trick or treating. The official American state religion of laissez faire capitalism may be the main problem. Americans are supposed to be 100% independent. If they don’t make it on their own, they deserve to die. As one Michigan militia member put it, Why call the police? Eliminate the middle man. Strangers are not people who will help you if you get in trouble; they are people competing with you for food, shelter, money and jobs. They are, in a sense, all out to kill you. American capitalism’s neo-Darwinism asserts only the fittest should survive. You should let the poor and weak and those without medical coverage die or starve. This is counter to Christianity and to the way things work pretty well everywhere else on the planet. American capitalism teaches you to see others as rivals, competitors and even enemies. The capitalism of other countries is tempered with the moral obligation to see to it your fellow humans have the basics of survival. As a result, Americans become mildly paranoid. It is them against everyone else. Obviously they need guns with those terrible odds. Americans develop a beleaguered mentality where they even sometimes start seeing family members as enemies. Their frustration at everyone else boils over on their loved ones. This is all so silly. When an earthquake hits, how do Americans really behave? They go to heroic efforts to help each other out!